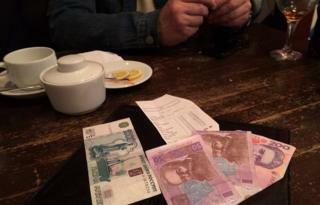 Russian roubles would not get me a coffee at a south Crimean service station on Monday, but they did buy a smile in a restaurant. "We don't take them yet," said the waitress. Would they be good next month? "Let's hope so," she replied breezily. As I counted out my Ukrainian hryvnya, I reflected that people in this charming resort town might be glad of any currency when the holiday season begins. Western sanctions, pariah status, TV images around the globe of soldiers and gunmen and, perhaps worst of all, dependence for years to come on a hostile Ukrainian mainland for road and rail links. Quite a bill for breaking away. Then there is Ivan Mamykin, who picked up his Ukrainian pension on 5 March and is expecting to be paid by Russia come April. "What if it's all an April Fool's Day joke on you, sir?" I asked across the tea glasses. In the great cackle of laughter from the 82-year-old former agricultural expert, it seemed the nervous tension dissipated. "I will get it on time and it will be better," was what he finally said. "I am sure of that because I know the Russian character: if they say they will do something, they do it." Speaking as if 60 days had passed, not 60 years, he conjured up an image of a Russia positively groaning under the weight of cheap groceries back in 1954, in contrast to Ukraine. That was the year the Kremlin attached Crimea to Ukraine. The last Ukrainian flags in Yalta were taken down on Sunday, he said, and now only Crimean and Russian flags flew over the city. "I voted honestly yesterday and woke up happy today," Mr Mamykin said. "It felt like I was living in my home country, Russia. Which is as it should be." And what if Ukraine shuts the borders? "We'll take the ferry to Russia," he said, brushing aside the question. Media captionLeonid, 21, from Yalta, Crimea: "I don't know how they will view a Russian degree in Europe or the US"
Leonid's ambitions clearly go a little further than a ferry ride to Russia across the Strait of Kerch. At 21, the Yalta local is a year away from completing his studies in graphic design at the town's university. He still stands to obtain a Ukrainian degree next year, but after that any further qualifications will be Russian. "I don't know how they are going to regard Russian academic qualifications in Europe or America," he said. The other issue for him is whether or not Russia will help his university by maintaining its academic status and boosting its teaching staff with new specialists. In Leonid's opinion, the only thing that really changed in Yalta on Monday - a new public holiday in Crimea - was that the mood among most of the people had lifted. Otherwise, everything stayed the same, he said, apart from on the news channels. People I met in Yalta appeared solidly pro-Russian, including two ethnic Ukrainian women, but the fact that aggressive pro-Moscow radicals were prowling around the main square must have intimidated dissenters from speaking. When I tried to interview a third person near the Lenin monument by the sea front, we were hassled by three very aggressive young men who stuck a video camera in the face of my interviewee and demanded to know his address. I abandoned that interview out of concern for the safety of the man who wanted to speak to the BBC, even though he had voted to join Russia on Sunday. The pro-Russia activists had pitched a tent on the square, apparently to replicate the Maidan camp in Kiev in miniature, only with diametrically opposed views. Yes, the last official Ukrainian flag came down overnight, but nobody had removed any other Ukrainian state symbols or street signs yet, they complained. In a restaurant, I talked to two men who were out for a drink to celebrate the referendum result. Quite senior officials in Moscow and Crimea, they did not want to be identified. The man down from Moscow was a little bleary-eyed, possibly also because of the two-hour time difference which the new Crimean leadership plans to scrap at the end of this month. What he could not understand, he said as he showed me some roubles, was why his Russian mobile phone had suddenly become blocked on Monday, while a local mobile he carried worked just fine. I asked his friend if the seemingly irresistible move to Russian jurisdiction would hurt Crimeans working in the public sector. Not really, he assured me, as most had already worked under Crimea's own autonomous authorities. The exception was the Ukrainian military, he added, where officers who had sworn an oath to Ukraine were now torn between changing allegiance or leaving a place they regarded as home, where they had brought up their families and put down roots. One of the saddest sights I witnessed in Crimea this week was an embarrassed Ukrainian naval officer turning back foreign media who wanted to visit his base. Yes, there would have been plenty of military detail to film inside. But the real conflict is surely the one within these men, out of the camera's range, as the country they elected to serve slips further away by the hour.